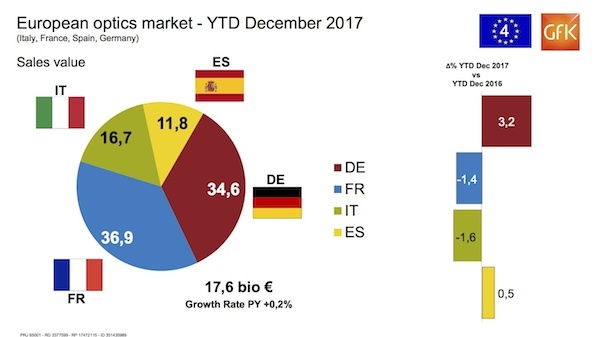 GfK has announced the latest figures for key European retail optics markets (Italy, France, Spain and Germany) as €17.6 billion for total year 2017 and a positive trend in value of 0.2 percent compared to the previous year. GfK’s Optics Panel tracks sales data in the optician channel for sunglasses, frames, spectacle lenses, contact lenses and solutions for contact lenses. 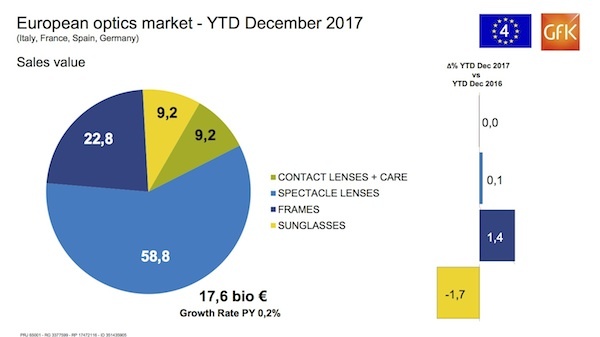 2017 figures show a yearly moderate positive trend of 0.2 percent of the combined optical market of Italy, France, Spain and Germany, registering a total turnover of €17.6 billion. Germany is sharply positive (+3.2 percent) and with this performance is able to make of for the loss of other countries and keep Europe 4 aggregation almost stable / slightly positive. Spain is also slightly positive (+0.5 percent). France’s negative performance is reflecting recent changes in government legislation, which limit the reimbursement of eyewear to €150 and reduce the frequency of renewal for spectacle glasses from one to two years. On the contrary spectacle frames, which are the top performers in the optics business, are showing a growing tendency towards the upper part of the market. The last 12-18 months have been heavily marked by a process of strong vertical integration – both at manufacturers and retail level. This evolving scenario is bringing new challenges and GfK is actively supporting leading players within the optics industry in 30 countries around the world. Reflecting the evolution of client requests, GfK is also further expanding our geographical presence: this year they will be opening Portugal soon followed by Belgium, thus completing our comprehensive coverage of the European region. The brand’s service portfolio will be also enriched by adding high value services such as Fit Audit tracking (a consumer program for contact lenses) which it is launching in Russia and soon in France and Japan.